Free download Reason Core Security latest version. Reason Core Security detects, blocks and removes harmful malware, adware and spyware faster then any other single product on the market. 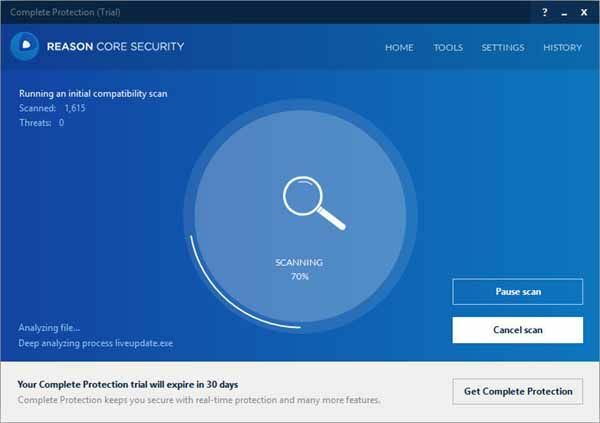 At the core, Real-time Protection prevents malware, adware and unwanted programs from sneaking onto your PC and Bundle Protection blocks unwelcome offers from being installed with software you download. Unlike most anti-virus products, Reason Core Security won’t slow down your computer or consume unnecessary resources. It’s quiet and unobtrusive, just like security should be. Keep your PC automatically threat-free! Standard Protection comes with a free 30 day trial of Complete Protection. Once the trial expires it will automatically convert to the free version.